Do you feel a little… distant today? The day after the 4th of July weekend brings with it the promise of barbecue leftovers and discount fireworks. It also sees our fair planet at aphelion, or its farthest point from the Sun. In 2015, aphelion (or apoapsis) occurs at 19:40 Universal Time (UT)/3:40 PM EDT today, as we sit 1.01668 astronomical units (AU) from the Sun. This translates to 152.1 million kilometres, or 94.5 million miles. We’re actually 3.3% closer to the Sun in early January than we are today. This also the latest aphelion has occurred on the calendar year since 2007, and it won’t fall on July 6th again until 2018. 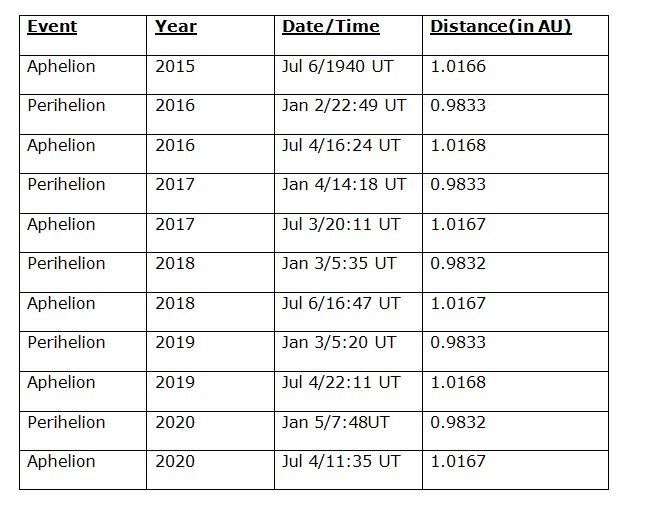 The insertion of an extra day every leap year causes the date for Earth aphelion to slowly vary between July 3rd and July 6th in the current epoch. Aphelion sees the Earth 4.8 million kilometers farther from the Sun than perihelion in early January. The eccentricity of our orbit—that is, how much our planet’s orbit varies from circular to elliptical—currently sits at 0.017 or 1.7%. It is ironic that we’re actually farther from the Sun in the middle of northern hemisphere summer. It sure doesn’t seem like it on a sweltering Florida summer day, right? That’s because the 23.44 degree tilt of the Earth’s rotational axis is by far the biggest driver of the seasons. But our variation in distance from the Sun does play a factor in long term climate as well. We move a bit slower farther from the Sun, assuring northern hemisphere summers are currently a bit longer (by about 4 days) than winters. The variation in solar insolation between aphelion and perihelion currently favors hot dry summers in the southern hemisphere. But these factors are also slowly changing as well. The eccentricity of our orbit varies from between 0.000055 and 0.0679 over a span of a ‘beat period’ of 100,000 years. Our current trend sees eccentricity slowly decreasing. The tilt of our rotational axis varies between 22.1 and 24.5 degrees over 41,000 years. This value is also currently on a decreasing trend towards its shallow minimum around 11,800 AD. And finally, the precession of the Earth’s axis and apsidal precession combine to slowly move the date of aphelion and perihelion one time around our calendar once every 21,000 years. The precession of the line of apsides versus the seasons. Image credit: Krishnavedala/Wikimedia commons 3.0 license. These combine to form what are known as Milankovitch Cycles of long-term climate variation, which were first expressed by astronomer Milutin Milankovic in 1924. Anthropogenic climate change is a newcomer on the geologic scene, as human civilization does its very best to add a signal of its very own to the mix. We also just passed the mid-point ‘pivot of the year’ on July 2nd. More than half of 2015 is now behind us. Want to observe the aphelion and perihelion of the Earth for yourself? If you have a filtered rig set to photograph the Sun, try this: take an image of the Sun today, and take another on perihelion next year on January 2nd. Be sure to use the same settings, so that the only variation is the angular size of the Sun itself. The disk of the Sun varies from 33’ to 31’ across. This is tiny but discernible. Such variations in size between the Sun and the Moon can also mean the difference between a total solar and annular eclipse. 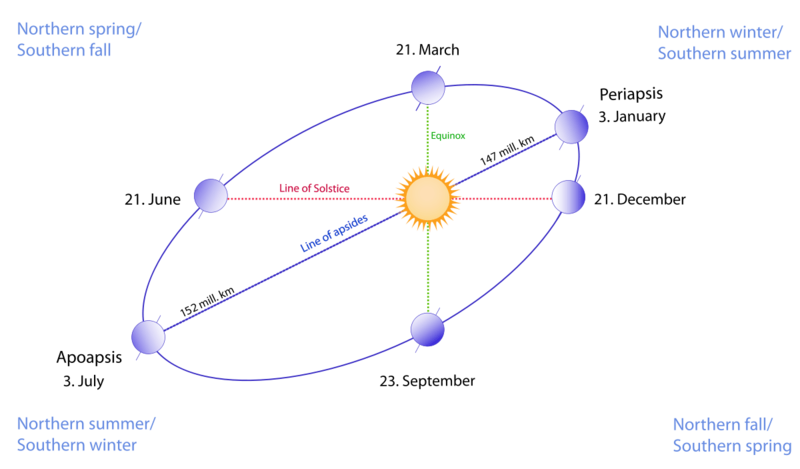 Should we term the aphelion Sun a #MiniSol? Because you can never have too many internet memes, right? And did you know: the rotational axis of the Sun is inclined slightly versus the plane of the ecliptic to the tune of 7.25 degrees as well. In 2015, the Sun’s north pole was tipped our way on March 7th, and we’ll be looking at the south pole of our Sun on September 9th. And of course, seasons on other planets are much more extreme. We’re just getting our first good looks at Pluto courtesy of New Horizons as it heads towards its historic flyby on July 14th. Pluto reached perihelion in 1989, and is headed towards aphelion 49 AU from the Sun on the far off date in 2114 AD. Sitting on Pluto, the Sun would shine at -19th magnitude—about the equivalent of the twilight period known as the ‘Blue Hour’ here on Earth—and the Sun would appear a scant one arc minute across, just large enough to show a very tiny disk. All thoughts to consider as we start the long swing inward towards perihelion next January. So this means we are about 5% further than our closest approach. Or about 2.5% different than our average distance. Or negligible if you are not into sun tanning or studying the sun. Cool. Well, not really. Need a whole lot more distance to feel cool. Previous PostPrevious Newest Planet: Is it Pluto, Eris or Extrasolar?